The assorted species of birch trees in the United States have some distinct differences from the various kinds of poplars located in the country. Poplars, known as cottonwoods in many places because of their white fluffy seeds, often share the same geographic range with birches, sometimes even growing in close proximity to them. Telling the two families apart requires knowledge involving the size, the leaves, the bark and the reproductive parts of both. Look for poplars to be much taller on average than birches. Poplar species such as eastern cottonwood, plains cottonwood and black cottonwood may easily exceed 100 feet in height. The tallest of the American birches, the yellow, paper and river birches, usually do not grow larger than 80 feet, and many birches are in the 20 to 50 foot tall range. Study the features of the leaves of these two kinds of trees. Birch leaves are typically oval to elliptical with a tapered point. The leaves of birches have toothed edges and prominent veins, with only a few species having leaves as long as 4 or 5 inches. Poplar leaves vary in shape from the nearly triangular leaf of eastern cottonwood that resembles the ace of spades in a deck of playing cards to the almost round leaves of swamp cottonwood. Poplar leaves can achieve lengths of 6 and 7 inches, with many having widths larger than most birch leaves are long. Examine the bark of birches, which is much more distinct than that of the poplars. Poplar bark on mature trees normally possesses deep furrows and ridges and is gray to black in color. 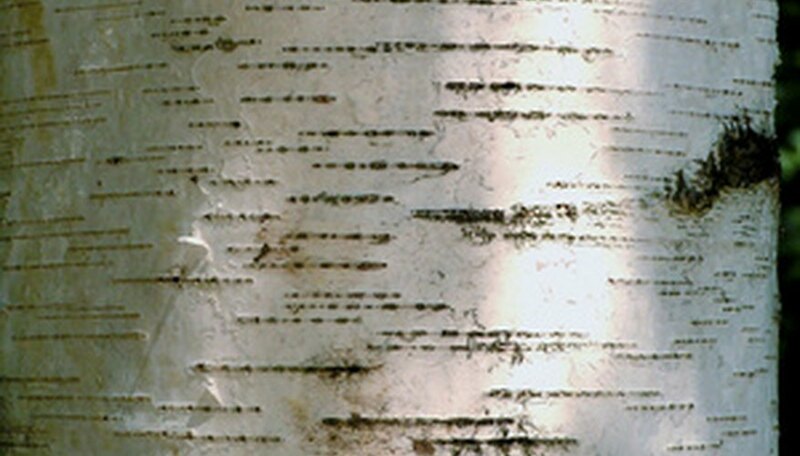 However, the bark on the birches varies from the white peeling bark of paper birch to the multicolored hues and peeling bark of the river birch. Young birches will often have smooth bark that then takes on its unique features as the tree ages. Inspect the flowers known as catkins on poplars and birches in the springtime. Poplars have male and female flowers on separate trees, so a poplar is either a boy or a girl. The female poplar flowers develop into a hanging thread of seed capsules that open when ripe, allowing the seeds to fly away in the breeze. Birch trees have male and female flowers on the same tree. The male catkins will overwinter on the trees after developing the previous growing season. The female flowers hang down and, when pollinated by the males, change into a cone-like structure that finally disintegrates, scattering the birch tree’s seeds. Scrutinize the habitat where you find birches and poplars. Birch trees usually grow in moist cool environments, with species such as paper birch, sweet birch and yellow birch all confined to the northern states and Canada. Poplars flourish in damp ground as well in many cases, but they will grow in much warmer areas of the country. The plains, eastern, swamp and Fremont cottonwoods are all trees found in the Deep South or the Southwest.